The sweetest treats are the ones made with care. 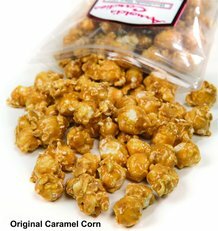 Smooth, light caramel melted over flavorful popcorn - this delectable caramel corn is handmade in small batches like the old days. No mass production. Just simple, authentic sweetness made to perfection. AMERICAN-MADE STORIES: Click here to read more about Arnold's Candies. Just like the "old days," this small Ohio company simmers their confections in copper kettles for a perfected, quality taste. 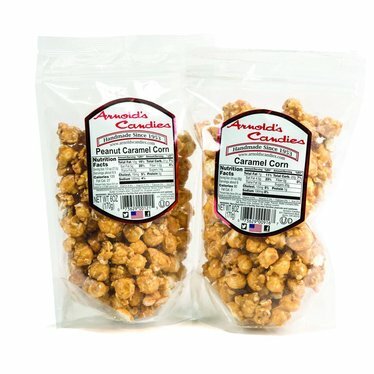 "We don't use any preservatives or additives, just the best sugars and nuts we can find," says Kyle, Vice President and partner of Arnold's Candies. All their candy is handmade just like they did when they first started 60 years ago. Manufactured in a facility that also handles peanuts and cashews. 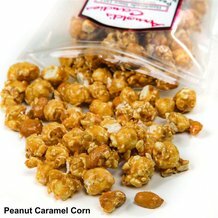 Peanut Caramel Corn: Ingredients: Corn syrup, pure cane sugar, peanuts, brown sugar, popcorn, butter (contains milk), soybean oil, soybean lecithin. It's always fresh, crunchy and it's never sticky! 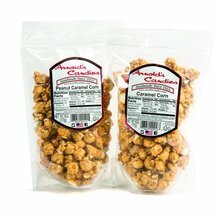 Best caramel corn you'll ever eat.